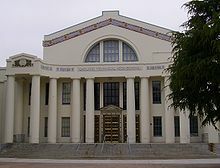 Oakland Technical High School, known locally as Oakland Tech or simply "Tech", is a public high school in Oakland, California, United States, and is operated under the jurisdiction of the Oakland Unified School District. It is one of six comprehensive public high school campuses in Oakland. Oakland Tech's attendance jurisdiction includes several neighborhoods, including Oakland Chinatown, Rockridge, North Oakland, and Temescal. Tech received the maximum 6-year accreditation from the Western Association of Schools and Colleges in 2009. Oakland Tech's main building was built in 1914 and resembles the main science building of the Massachusetts Institute of Technology. During the 1970s, when many California schools were being demolished and rebuilt for earthquake safety, Tech's main building was determined to be too historic to tear down. Instead, it was gutted and rebuilt on the inside, while its historic exterior was preserved. The school was declared the 99th historic landmark by the city of Oakland on July 23, 1985. While Tech was closed for earthquake retrofitting in the 1970s, the school was displaced to 5714 Martin Luther King Jr. Way (formerly Grove Street). This location is sometimes erroneously referred to "Old Tech" but was actually the campus of the now defunct University High School (1923-1948). That campus had then served as Merritt College from 1954 to 1966 and is considered the birthplace of the Black Panthers. In 1977 a group of students from a U.S. Government class at Tech launched a drive to create a California state holiday in honor of Martin Luther King, Jr.. The idea was not new - about a dozen states already had such holidays, and it had been proposed unsuccessfully at the national level - but it was still controversial. The students formed themselves into a group called "The Apollos" and lobbied for the holiday for four years; it was finally passed by the legislature and signed by the governor in 1981. In 2008 two students at other Oakland high schools heard about the Apollos and made an award-winning short documentary film about their successful quest. Students at Oakland Technical High School have the option of enrolling in one of the school's academies, which operate as small subsets of the school. Students take one class within their academies and spend the rest of the day in normal classes. Academies at Tech include Computer Academy, Health Academy, and Fashion, Arts, and Design Academy. The Engineering Academy focuses on mechanical engineering. Starting in 10th grade, the students in this academy study engineering, physics (focused on mechanics), drafting, architecture, etc. Paideia is an advanced History and English program founded by Mary Ann Wolfe, a political science and government teacher who worked at Oakland Tech for over thirty years. In the sophomore year, students have the option to take English 2 Paideia and World Cultures. In 11th grade, students have the option to enroll in AP or HP English and US History. In 12th grade, students who are recommended may take the advanced senior block, consisting of AP Government, AP Literature, and HP Comparative Government, in which they analyze works of art and compare them to the government. In senior year, students, according to grades, are also able to take AP Government and AP English 4. Students can be jointly enrolled in Paideia within select academies in 10th grade and any academy in 11th and 12th grades. In 2008, over half of the advanced senior block was accepted to the prestigious UC Berkeley. Students regularly score 4s or 5s for AP classes taken in the Paideia program. The Race, Policy, and Law academy began in the 2017-18 academic year. Oakland Technical High School is a Title I school and approximately 53% of the student body qualifies for free or reduced price lunches. The total school enrollment in 2016-17 was 2,037 students. Tech is a highly diverse school, with students comprising a range of racial, ethnic, and socio-economic backgrounds. In 2016-17, the student body was 32% African American, 24% white, 22% Asian, 16% Latino/Hispanic, 2% Pacific Islander, and 4% other. After being sued for refusing to do so, the Oakland Unified School District mandates that every school publish a public record of their standing on a variety of standardized tests and other quantitative analyses. ^ Berton, Justin (July 16, 2008). "Student film tells of drive for King holiday". San Francisco Chronicle. Retrieved 16 December 2013. ^ "Pathways/Academies | Oakland Technical High School". oaklandtech.com. Retrieved 2017-10-02. ^ Tsai, Joyce (November 22, 2017). "The Wrong Path?". East Bay Express. Retrieved 29 December 2018. ^ "School Profile | Oakland Technical High School". oaklandtech.com. Retrieved 2017-10-02. ^ Rowell, Margaret. "Master teacher of cellists, and humble student of nature : oral history transcript / and related material, 1982-1984". Archive.org. pp. 85–86. Retrieved 20 February 2016. ^ "The Brico Requiem". Westword. Retrieved 20 February 2016. ^ "Wilhelmina Wolthius Class of 1919". School Historical Archive. Retrieved 20 February 2016. ^ "Jack Hayford, Class of 1952". School Historical Archive. Retrieved 20 February 2016. ^ Drooz, Alan (March 21, 1990). "These Two Teams Have Guards Up : Loyola Marymount: Terrell Lowery, the Lions' sixth man, has taken over the role of a team leader". Los Angeles Times. Retrieved 15 February 2016. This page was last edited on 4 April 2019, at 06:05 (UTC).